Loved Isaac & Emma’s laid back countryside wedding in the heart of the Peak District, as wedding photographers based in the Lake District we love to head back to the Peak District for weddings too. Emma was excitedly getting ready in Hathersage whilst Isaac and the men waited for the village pub to open! Emma looked amazing in her princess gown surrounded by her giddy bridesmaids and their attempts to shoo off the bees from the bouquets! The wedding took place in the traditional beautiful St Michael & All Angels church in Hathersage – the ceremony was lovely with lots of enthusiastic singing before guests showered the happy couple with confetti and then they all headed off in the VW camper to the reception at Fields for Venues in Wardlow with stunning views of the countryside and a beautifully decorated tipi. Emma & Isaac were reunited with their beloved dog Max who was very pleased to see them! Guests enjoyed the sunshine before they feasted on a BBQ and a brownie pudding bar! The speeches were both touching and funny. In the evening the amazing Warning Tones band kept the guests dancing all night. Such a beautiful day for two amazing people. We wish you both much love and happiness for the future. 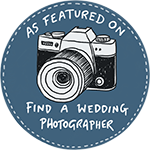 Paul & Helen are Lake District wedding photographers based in Fletchertown near Carlisle. They also photograph weddings in Sheffield and the Peak District. They love Lake District weddings and weddings in Cumbria.